Rossetti painted Beata Beatrix after Elizabeth Siddal’s death. Although studies had been done before Lizzie died, the work is mainly posthumous and is considered to be a memorial tribute to the artist’s wife. Beata Beatrix is one of Rossetti’s finest masterpieces and is filled with symbolism. I am currently reading The Hidden Life of Art, which quotes Oscar Wilde on the interior dustjacket flap: “All art is at once surface and symbol. Those who go beneath the surface do so at their own peril.” I think we must risk the peril and dive beneath the surface. I invite your comments. Dante Gabriel Rossetti always identified with Dante Alighieri, so it was perfectly natural to cast Lizzie as Dante’s love Beatrice. As always, his view of Lizzie is as an extension of his own experience. Dante is his lifelong obsession, so Lizzie must be Beatrice. How peaceful she looks. Is she in prayer? Meditation? A state of bliss as she transitions from the earthly world to a heavenly one? Or is this state we see in her face and in her posture reminiscent of Lizzie in a drugged state? Gabriel must have seen her under the influence of laudanum. Is this how she appeared to him? And is this his way of seeing her in a different light, forever changing her drugged high to a religious one with this painting. This marks the second time Elizabeth Siddal is painted or portrayed in death (or at least close to death). In Ophelia, her hands lay open as she floats along the water. Open, but welcoming nothing. There is a vacancy. Here again, in Beata Beatrix her hands are open. Open and ready to welcome the poppies that the Dove (red, the color of love) is bringing her. Poppies – whose seeds are the source of Opium without which, Lizzie could not have had her laudanum. You want to discuss Beata Beatrix, you want to discuss a person’s innermost thoughts and feelings? Whose are reflected in the way Rossetti has portrayed Lizzie’s face? By the time Lizzie was painted here there had been many trials and tribulations in Lizzie’s life, many caused by the conflict between Victorian values and the rather looser morals and behaviours of PRB colleagues, a conflict several of them ignored or came to terms with in their own way. I suspect that as a woman, Lizzie was somewhat more sensitive to such things than her male friends and acquaintances. Rossetti’s inablility to make a committment to marriage and a more settled family life was probably at the root of Lizzie’s problems over a period of many years. She could see that what was in prospect would never fit the model of Victorian family life, and to some degree, this must always have been an issue between them. I believe that as an intelligent woman, Lizzie must have pushed Rossetti as far as she could, but ultimately been totally frustrated at her inability to change things. I think you can read frustration in her own drawings, paintings and verse. In other paintings, Lizzie looks resigned to her fate, and I think that behind her sad looks are thoughts quite at odds with what the artist might think that she is thinking. It is as if for perhaps the first time in Beata Beatrix, Rossetti is portraying Lizzie knowing that he has not met her expectations. He gives her face an expression that acknowledges Lizzie detaching herself from his world, not angry, but absorbred in her own thoughts. If Rossetti is being honest with himself in this case, this is his apology. For me, Lizzie’s benign and gentle frustration comes over in her expression; if this is Rossetti’s knowing portrayal of this, he is showing her active in thought, behind the wall in her mind where she doesn’t let him get to her. If he is just representing her as she often appeared when she shut herself off from the world, then she could be seen as simply being lost in a laudanum induced haze. This is doing her an injustice – all the evidence suggests that she was an intelligent, thinking woman. Zoom in and look at the expession in her eyes and position of her lips in the various versions and other pictures of Lizzie. I think this is the only one where Rossetti is being honest with himself. To some extent, the symbolism supports this, but for me, the picture stands alone without it. All that apart, there is something very captivating by the Beata Beatrix experience. The first time I stood in front of the real thing was like coming out into the sunlight from a dark room. It took a while to get past the initial ‘shock’ to be able to focus on the detail, but all the time being drawn to her experession. I saw many things going on in her mind, not her being in a dream state under the influence of laudanum. What an intriguing possibility…one I had never considered before. It has been said time and time again by those who knew him that he was a haunted man for years, and felt a huge amount of guilt where Lizzie was concerned. So, to look at Beata Beatrix not only as a memorial, but as an apology is a fresh approach for me. And it rings true. It’s interesting how different the finished product looks from the study Rossetti drew. In the study at the Rossetti Archive, Lizzie looks so young and innocent. And her eyes are open, so that makes alot of difference. And in later versions of Beata beatrix, Rossetti seems to have included features he also used to glamourize Jane Morris–the bow lips especially. One of the things that has always most struck me about the painting is the mystical nature of Lizzie’s expression. She looks as though she is in mystical trance, a contemplation of heavenly states that is much in keeping with Rossetti’s view of her as an ethereal being, not a ‘real’ woman at all (hence his poor treatment of her throughout their relationship). But he captures the longing and yearning for her that he must have felt after her death, as well as her own longing and yearning spirit, which (maybe?) pined for a better life in other realms than those of earth. For me Beata Beatrix shows in a deeply symbolic way, an artist coming to terms with a huge trauma in his life in the only way he knows how. Rossetti was gifted enough to be able to portray his loss in this magnificent picture. Powerful forces were at work. For me it is no wonder we were gifted such a masterpiece. Beata Beatrix was perhaps the second painting of DGR’s that I happened to come across. Of all of his works, this is the one I would most like to see in person, and it is without a doubt my favorite. It never fails to captivate me. I feel I could stare at it for hours. The small details, the rapturous expression on her face, the way she is holding her hands, not quite in prayer, but almost to indicate her full surrender to the experience. What I see in her face is nothing less than paradise. Complete peace with herself and the divine, something that was so illusive to her in life. I meant to say “elusive” in my previous post, an interesting misspelling, for yes, peace was also perhaps “illusive” to Lizzie too, something she just couldn’t quite seem to grasp during life. For 3 months in 2000, the Tate gallery in London put on a special exhibition called Ruskin, Turner and the Pre-Raphaelites. There were over 250 exhibits featuring some of the most important and influential works by the artists of the time. On May 22 of 2000 I had a spare day in London and perhaps because I was on my own for the day, was able to be totally and unreservedly self indulgent amongst paintings and drawings that had been conceived, produced and touched by the artists themselves. Aside from seeing at first hand and close up works such as ‘Christ in the House of his Parents’, ‘The Light of the World’, ‘The Awakening Conscience’, ‘The Scapegoat’.and ‘April Love’, there were as could be expected, many paintings and drawings by and of Lizzie Siddal. Beata Beatrix was the most captivating of them all. I bought a 2/3 size print that is on the wall at home. If you ever get the chance, go beyond talking and writing about it; see it. You will find it hard to walk away. I have had the awesome good fortune to have seen both the Tate Gallery version of this as a college student in London and the Art Institute of Chicago version as it is close to where I grew up and still live today. I’ve spent quite a bit of time tucked in that quiet corner of the Art Institute in contemplation. I feel inadequate to put into words what this painting means to me. Its been there for me in many of the most significant periods of my life as a connecting thread. It may be selfish of me to say it, but I’ve never tried to consider too deeply what DGR was thinking or trying to convey as he painted it. Its always had so many associations to my own life. You folks have given me some great, heretofore unconsidered perspectives! There’s a spiritual quality to this painting, that ethereal glow, that the rest of Rosetti’s paintings never achieve, in my mind. It has meant death to me (both figurative and literal), illness, unhealthy addiction or obsession, cruelty and its results…. but also tranfiguration, peace, joy, change, and certainly love. I could go on and on, but I’ll shut up now and leave this to the more coherent! I hope you find your old paper. Sounds fascinating. I’d love to hear some of your conclusions. Via Times Online: An exhibition celebrating the Italian origins of Dante Gabriel Rossetti, the Pre-Raphaelite painter, and his sister Christina Rossetti, the poet, has opened in the picturesque hilltop Adriatic seaside town of Vasto. The centrepiece of the exhibition of specially loaned paintings, photographs, letters and books at the recently restored Palazzo d’Avalos is Dante Gabriel’s painting of his doomed wife, Elizabeth Siddal, as Beata Beatrix. On loan from the Tate Gallery, it is displayed in a room of its own on the piano nobile of the former hilltop palace overlooking Vasto’s sparkling blue bay and long sandy beach. 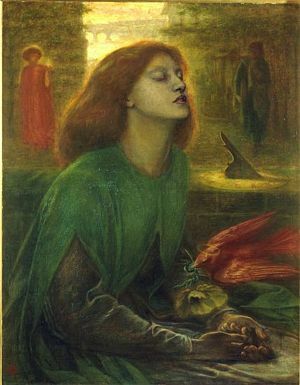 Jan Marsh, the biographer of both Dante Gabriel and Christina, and curator of the exhibition, said the painting, which depicts “Lizzie” as Beatrice, the muse of the great Italian medieval poet Dante Alighieri, appeared “bigger and even more luminous when singled out than it does at the Tate”. It is lit to appear glowing on a dark red background of the kind favoured by the Victorians. Read Full Article. Exhibition runs until November 16th. Can anyone provide me with clear interpretations of “Beata Beatrix” combining Freud’s “uncanny” and Lacanian theories? I am (unfortunatley) a college drop out. I studied art and really enjoyed art history. I have decided that in my spare time i am going to pick up my old college books and perhaps study the things i did not get through. Ophelia has always fascinated me and now i love Beata Beatrix. I was just wondering how all of you found some decent websites to research these types of paintings because this is the first one i have found that has been any help, but i am studying other paintings and abstract sculptures such as “Anslem Kiefer, Waylands Song” and “Paolo Uccello, The Battle of an Romano” If anyone has any thoughts as to where i can find such information i would be very greatful. Thanks. The senses, you see that reason’s wings fall short.